Espionage. Cloak-and-dagger mystery. Political intrigue. Unguessable plotlines. Visions of extreme opulence and depravity. Sound history. Strong, descriptive prose that shrewdly exposes the subtle forces at work in a polluted Russian Court. These are but a few of the elements Eva Stachniak brings to the pages of her new book, THE WINTER PALACE. 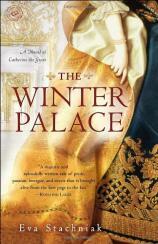 "I cannot recommend THE WINTER PALACE highly enough. Any reader who enjoys history or historical fiction will be sure to love this book." This two-part historical is all about the person behind the elusive figure we call “Catherine the Great.” It’s the story of her making, of how a “petty” German princess from a little town called Zerbst manages to survive her lingering years in the Russian Court and then rise, through cunning and secrecy, to take the title of Empress of Russia. The book is narrated by a spy named Varvara Nikolayevna, a girl not much older than Catherine. Varvara had been a bookbinder’s daughter before being orphaned and left to the mercy of Empress Elizabeth Petrovna. Like Catherine, Varvara had high hopes for what being at court might mean for her future, but discovers what little value there is in the “pretended protection” of ruthless Elizabeth. She does the only thing she can to survive; in Elizabeth’s court, that means serving as a spy. Varvara witnesses the arrival of young Catherine alone in this nest of vipers, and of all the servants and spies, she is the only one who chooses pity and befriends an imprisoned child. As one of Elizabeth’s servants, Varvara knows full well the scope of Catherine’s vulnerability and the consequences of changing loyalties. She makes an unprecedented move that is beyond dangerous and may very well end in her own death, or worse, the annihilation of her family (a concern for Varvara once she has a daughter to care for). But Varvara is not a spy in her heart. Valuing friendship and ideals over duty to a tyrant is something she believes in and hopes will change the future of Russia for the better. The many sullied intentions of Catherine’s enemies are things Catherine begins to become aware of through Varvara’s help. In the Winter Palace, she is surrounded, mistreated, isolated, and made into a simple “vessel for the royal heir.” Catherine recognizes that the nobles, royals and servants don’t care for her. Elizabeth’s nephew, Peter, clearly doesn’t love her, but Catherine is betrothed to him and does win him over to some degree. They marry in an extravagant ceremony when Catherine is little more than a child, which seals her future in a sense and makes her a permanent captive. Once the royal couple fails to produce an heir in the coming years, Catherine discovers that Peter’s interest in her is beyond waning. Varvara’s influence during this time changes things, and the court spy seems to be the sole grounding force for the princess’s sanity. Through the years, in secret, Varvara meets with Catherine frequently, making plans and sowing hopes. Going beneath the wicked surface of the court, the women enter the frightening, dirty underbelly of the palace’s secret keepers. Catherine sees clearly that every line of communication leads back to the Empress. Her only hope for freedom is in ruling. Thus she abandons all hope for the affections of her husband and begins to pursue numerous affairs in secret. During Catherine’s many years at court, the entire palace is held hostage by the fleeting, emotional inclinations of a tyrant. Elizabeth is nothing but a spoiled child, a lover whose endless amorous desires are unparalleled and whose ruthlessness is well known despite her public image as a compassionate governor. Elizabeth has no love for anyone save those of her own blood, and recognizing this, Catherine sees clearly that her only chance for being free is to use secrecy and politics to her advantage. The question is: Will Catherine’s character and integrity survive playing Elizabeth’s game? Will her friendship with Varvara survive it, and who will pay the price for Catherine’s crown? Eva Stachniak creates a very shrewd, fascinating, intense story that casts doubt upon Catherine’s hazy reputation as an unsullied leader and asks how anyone can handle power without being corrupted by it. She focuses on Catherine the youth rather than “Catherine the Great” --- on the making of a ruler rather than the subsequent events that led to Russia’s Golden Age. This is an interesting perspective, to say the least. Having two fascinating protagonists adds to the ongoing mystery and gives the book an element of surprise. A second volume is being planned, focusing entirely on Catherine’s perspective of the same events and story told here. This is a fantastic way to approach a historical series and adds a unique element to the storytelling. I cannot recommend THE WINTER PALACE highly enough. Any reader who enjoys history or historical fiction will be sure to love this book.